Our new issue is at the printers! Print subscribers should get their copies in the first week of January (the holidays will delay things a bit), and I expect to email the issue to e-subscribers early next week. In this issue, we paired the article “How Private Equity Works—And Why It Matters,” by Eileen Appelbaum and Rosemary Batt, with Dutch Renaissance painter Pieter Bruegel’s Avaritia, from his Seven Deadly Sins. Breugel depicts not only Greed (as a mythological figure), but a host of surrounding figures whose machinations illustrate the sin. And Bruegel lived in the 16th century, so he didn’t know the half of it. Appelbaum and Batt describe how private equity firms buy out target companies with borrowed money, load them up with debt, strip them of valuable assets, and pay themselves extraordinary dividends and fees. And it’s (mostly) legal. In his article on the Federal Reserve’s recently announced interest-rate hike, Marty Wolfson explains that the Fed is planning on paying banks billions of dollars in interest (even though it need not). It’s a windfall for the banks, and just another example of how the public authority acts in the service of private “greed.” The Fed’s conduct of monetary policy is channeled through private banks and beholden to their interests. More, its decision-makers see it as their sacred mission to act as protectors and benefactors to high finance. Matías Vernengo gives us yet another example, this one from Argentina. The country’s newly elected right-wing president has promised currency and spending policies that would be misguided—though could be rationalized—as responses to a serious international payments crisis. Yet there is no such crisis in Argentina! The only way to make sense of these policies is as a deliberate offensive, on behalf of the wealthy elite, against the laboring masses. 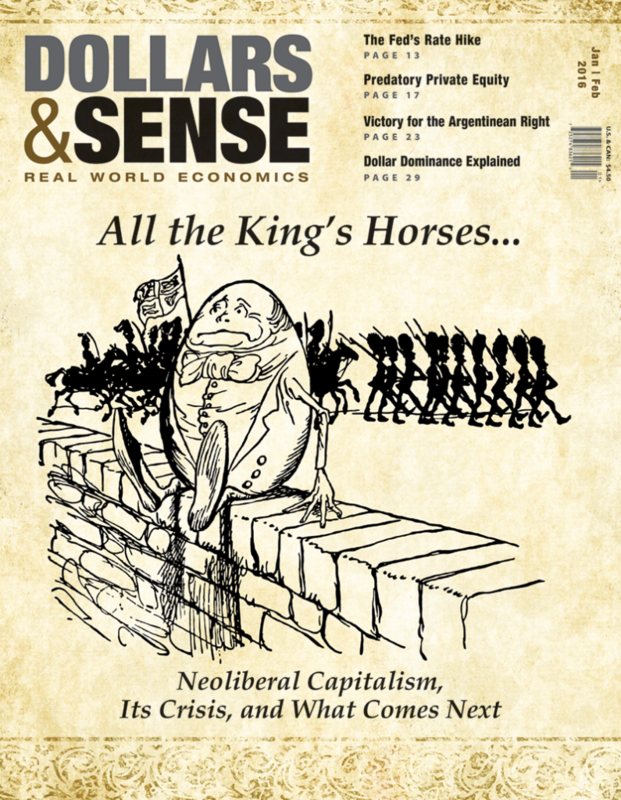 The neoliberalism that Vernengo recognizes as “resurgent” in Argentina, after an interlude of relatively pro-worker and pro-poor policies, meanwhile, has been the dominant tendency of capitalism worldwide for decades. As David Kotz argues in his cover story on “Neoliberalism, Its Crisis, and What Comes Next,” this epoch has seen the most predatory and destructive forces of capitalism unleashed from the restraints of labor organization and state regulation. A critique of greed, a condemnation of it as a sin (as Breughel’s engraving frames it), however, simply does not suffice. In the medieval morality play, the social order torn asunder by sin is restored by purgation and repentance. In the police procedural of modern capitalist society, the social order upset by crime is restored by the administration of justice. Far from being an offense against the order of contemporary capitalist society, greed is at its foundation. Greed is neither a sin whose perpetrators must fear for their souls, nor a crime whose perpetrators must fear earthly justice. And the battle against institutionalized greed seeks not to restore the social order, but to overturn it.